Like many Millennial and Gen X New Zealanders of my generation, my knowledge of New Zealand’s nuclear history has been told through my parents’ stories. My mum protested after the sinking of the Rainbow Warrior in the 1980s and my dad traveled throughout the Middle East when the Soviet Union was the dangerous part of the world to travel to. But aside from studying these events and time periods in high school history, I have little firsthand knowledge and understanding of the impact nuclear weapons have had on our society. Despite the Soviet Union collapsing only a few years before I was born, I really have no idea what it was like to live in a society which feared nuclear war. We don’t really appreciate how lucky we are to live in an isolated country where exposure to nuclear weapons is unlikely. We don’t live in fear, although being nuclear-free is a big part of our identity. Our generation is actually largely apathetic towards nuclear issues as we feel the war has already been won. It’s hard to imagine the destruction which these types of weapons have caused the planet or to imagine that we could still potentially experience it again in our lifetimes. The Cold War is over, the arms race is over. Despite this, there is still a risk that nuclear weapons will continue to pose a threat to the world. They are difficult to disarm in a way which ensures their very existence is a continuing threat. In the wrong hands, one nuclear weapon has the potential to destroy the world as we know it, hence the need for disarmament and neutralization of nuclear weapons. As much as they may form part of a state’s identity and sense of pride, they pose grave danger to the rest of the world. While nuclear energy can also form a crucial aspect of a state’s energy reserves, it can too pose a grave danger if left unchecked. Nuclear disasters such as Chernobyl and Fukushima demonstrated the deadly and destructive power of nuclear energy, even when they are not weaponized. The nuclear forces of today are hundreds of times more powerful than the weaponized bombs of World War II, and could destroy our planet with a mere press of a button. Every 15th of September, we celebrate the International Day of Democracy, which was established by the United Nations in 2007 to celebrate, promote and recognize the principles of democracy. While the way in which democracy is expressed across the world may vary, it is defined by citizens’ ability to participate in public decision-making, typically through choosing their government. In New Zealand, we accept democracy as a fact of life, perhaps to the extent that we forget that many other countries around the world do not have the right to choose their political representatives based on their policies and ideas. Not only do we take for granted our right to choose our leader, but also the other freedoms associated with democracy – our rights to freedom of association, of assembly, of protest, of speech and expression. We feel that we can ultimately hold the government accountable for decisions we disagree with, so the government is wise to largely adhere to its voters’ views. To understand how democracy forms an integral part of society, you only need to spend some time on the steps of New Zealand’s Parliament, watching groups with posters, banners, microphones and passion, loudly and visibly bringing public and political attention to an issue which is important to them and holding the government to account, no matter how big or small the issue. New Zealanders feel secure in their right to criticize the government directly, in the news media, or online. We take these rights for granted, however, it is important to remember that people overseas in 2018 have been arrested for less. 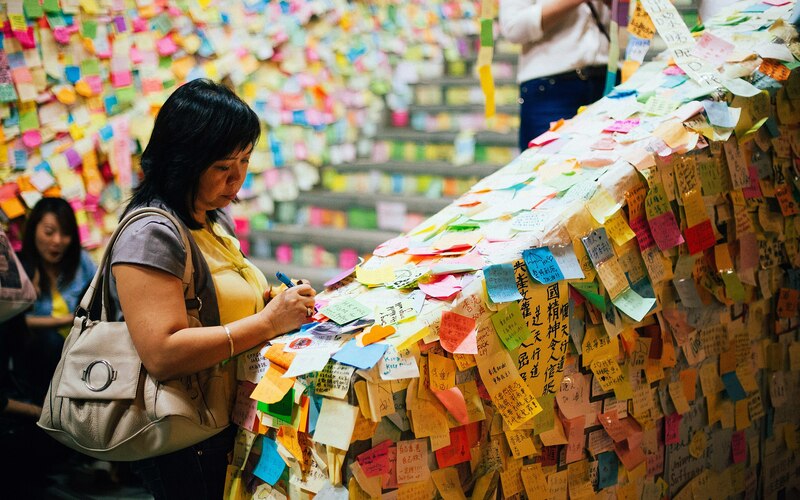 A woman writes a message during the Hong Kong democracy protests of 2014. In many ways, democracy is about more than just casting a vote. It represents a system where the government serves the people, not subdues or controls them. We give over money through taxes and some rights to our personal autonomy in favour of a government which administers the collective funds and rights for the good of the majority. We trust the government to do well by us and if it fails, it loses in the ballot box. For most New Zealanders, the thought of living under a non-democratic or one-party government is resigned largely to dystopian literature and films. The turnout of young people at the voting booths is low; we underestimate the power our vote has to influence the future of tomorrow. However, some of our closest geographic neighbours have restrictions on political freedoms which we really cannot fathom living under. We are lucky in this regard – New Zealand can look forward to a future where everyone is free to express their views, disagree with or criticize the government, protest, and be actively encouraged to do so. To celebrate the International Day of Democracy, think about how you can participate fully in political life. Did you vote in the last election? If you didn’t vote or you aren’t yet old enough to vote, do some research into the importance of voting in a democratic society, find political parties whose policies align with your beliefs, and understand what is important to you and how best you can have your voice heard by the leaders of our country. Central to the work a humanitarian does, is the care of people and promotion of their welfare. A couple of weeks ago World Humanitarian Day recognised the incredible work done by our many humanitarians across the world, particularly aid workers who put their lives at risk for the welfare of others. This day also strives to raise awareness of the countless people adversely impacted by armed conflict. Where finding safe drinking water and nutritious food is a daily struggle. Where children are stripped of their innocence and right to education by being used to fight wars they didn’t start or want. Where women are degraded. Where every citizen, irrespective of gender, ethnicity, sexual orientation and occupation are put in a compromised position of mental and physical safety day in and day out. The work our countless humanitarians do is particularly important when considering our contemporary societal contexts; where conflicts are rampant. 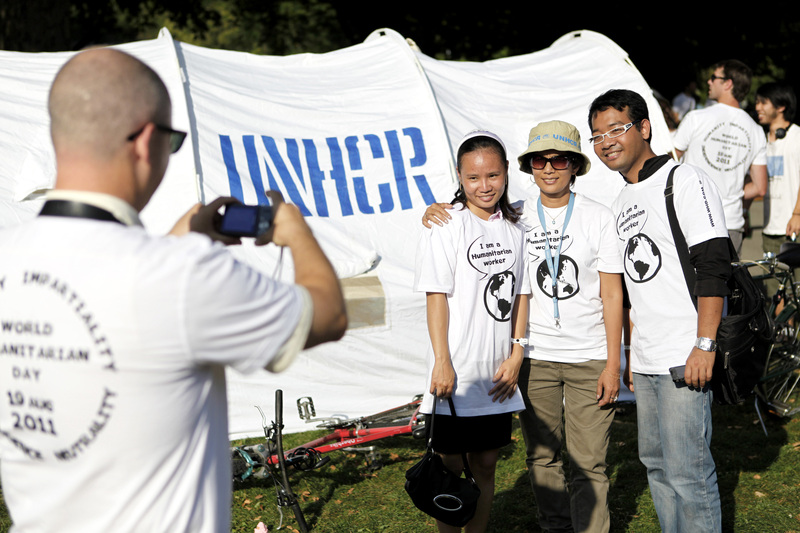 Participants in the UN Office at Geneva (UNOG)’s World Humanitarian Day activities, pose for a photo. We, as citizens of Aotearoa are placed in a fortunate position in the sense that these aren’t problems for us – but that doesn’t mean we shouldn’t care about the welfare of others; that doesn’t mean we can’t be humanitarians in our own respects. I challenge anyone reading this to be a humanitarian – to thank your friends, families, caregivers, bus drivers and teachers for doing all they do to make your life a safe and enjoyable one. I challenge you to take the time to reach out to both those you know, and those you don’t, and offer a hand, a shoulder to cry on. My high school principal used to tell a lot of super inspiring stories. There are a few that stand out. Among these, lies the message that small acts of kindness can go a long way. Therefore, I challenge you to be there for those around you, to support them; to be a humanitarian. Let’s do our part to help make a world ridden of conflict, one a little brighter and a little safer. With the 2019 delegation of the Global Development Tour being announced, I thought it was a good opportunity to share some of the 2018 delegations experience, in the hope that it can inspire the next delegation and encourage those wanting to apply in the future. In January this year I was fortunate enough to be part of the 2018 Global Development Tour delegation. We travelled around Europe and to New York learning about global development, international cooperation, and the role the United Nations plays in both. In essence we were shown the world through a future lens – as it could be in 2030, meeting policy makers, businesses and NGOs and being shown how they are working to meet the Global Sustainable Development Goals of the United Nations. Each of the cities we visited represented a theme within the Sustainable Development Agenda and we looked at the SDGs from three different angles; Policy, Business and Community. It was incredibly inspiring to see the work and connectedness of these organisations in different parts of the world. We also were very lucky to attend a Model United Nations conference at Columbia University in New York. CMUNCE hosts delegates from all over the world and it gave us an opportunity to actively participate and engage with like-minded delegates from varied backgrounds and the chance to engage in real-world diplomacy and listen to some fabulous speakers! My role as China on the Security Council debating the situation in Myanmar enabled me to further interact with Human Rights NGO’s and learn about the real work that is being done on the ground. The trip is a chance to meet new friends and create amazing memories. This has been an incredible life-changing experience and for those, thinking about applying in the future, DO IT, you will not regret it. 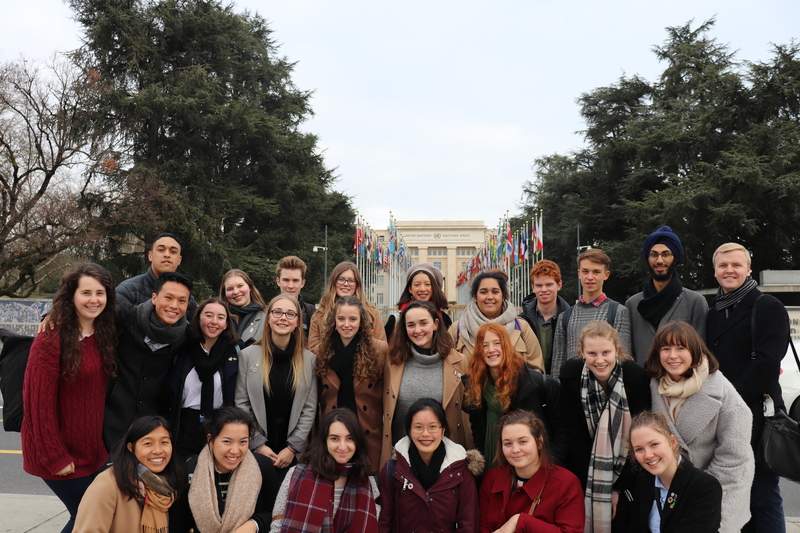 The 2018 delegation gathers for a photo in front of the United Nations Office at Geneva. Being one of the few delegates coming new into UN Youth in the GDT group, the trip had very different impacts on me. I had heard of the organisation but had not engaged with the events offered to people my age until the application for the Tour. I was honoured to have been picked from so many outstanding candidates and veterans of the organisation. The Tour changed my life because it opened me up to so many new people and new experiences. On the Tour we met many amazing people doing important jobs to attain the United Nations Sustainable Development Goals, people who could make real differences. We had the chance to listen to their past achievements, plans and future goals; while picking their brains and giving our own suggestions. Along the way we got to interact with the landscape of the world, living the cultural and historical differences. Since getting back from the Tour I have strongly kept in touch with others from the delegation as we all embark upon new chapters of our lives. I was inspired to give back to the organisation and enjoy frequently volunteering at UN Youth events, meeting new people and making connections. GDT changed my outlook on sustainable development, helped me make lifelong friends and connected me with an organisation which encourages civics interaction through youth facilitating youth events. It is fair to say my life was clearly changed for the better. The Global Development Tour was an incredible experience and something I had dreamed of for a long time. 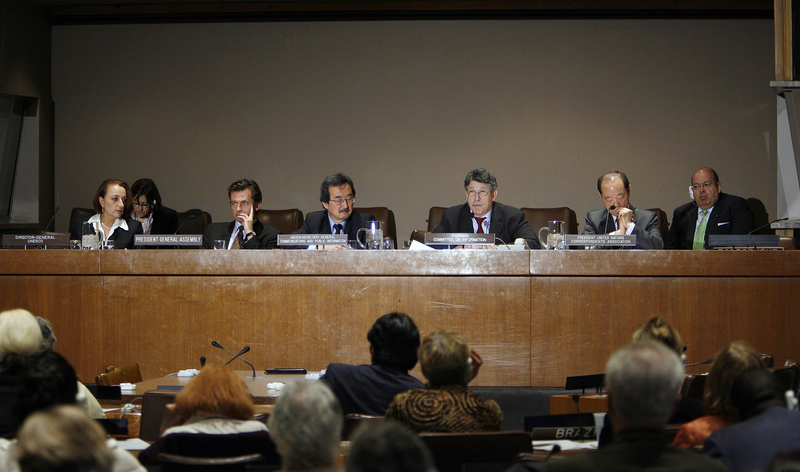 The message that stood out to me the most from our meetings was that development and sustainable development was not an isolated problem that only impacted small parts of the world far away from me, instead if we truly want change and progress, then a concerted united global effort was necessary. This has completely changed how I viewed a number of global issues. Following the tour, I have had the chance to speak to groups about my experience and helped to organise Victoria University’s very first Sustainability Week. But more importantly to me, it has shifted how I talk about international issues such as the health of our waters, gender equality and ending poverty. I have realised that I can make a difference in my own life, in my community and in my country – which all contributes to changing the world and being a global citizen. 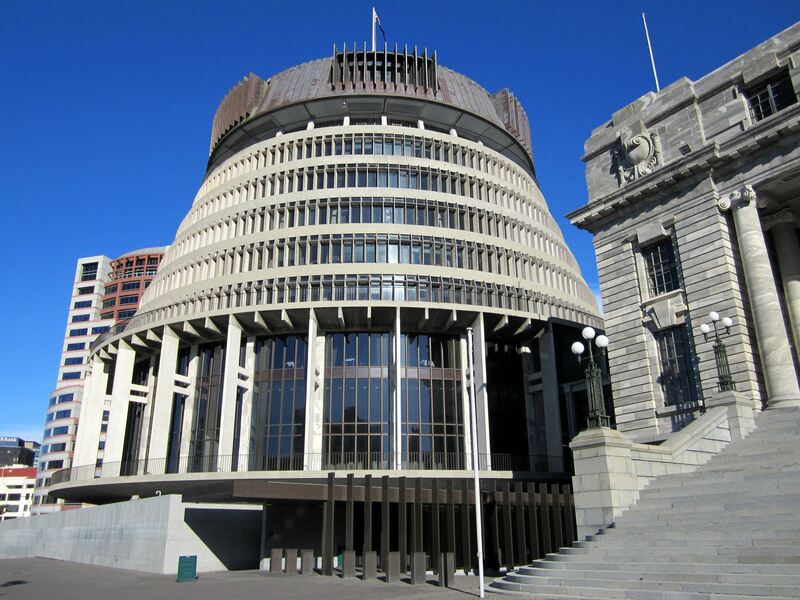 Around half of New Zealanders are under the age of thirty-five, yet the average Member of Parliament in this country is in their fifties. Aged 23, Chloe Swarbrick became the youngest MP since Marilyn Waring entered Parliament in 1975. When a government is designed to represent the people it governs, it seems odd that the voices of young people have very little representation at the decision-making table. I was lucky enough to attend the 2018 Festival for the Future, an event which both celebrates and amplifies the voices of some of Aotearoa’s most inspirational young change-makers. Hearing about the achievements, the accomplishments and the selfless service so many inspiring rangatahi already packed into their young lives was truly moving. So many of the young speakers and panelists were wise beyond their years and it was easy to forget that they were the same age as me, many actually younger. The most profound characteristic of the Festival was that the panels and speakers were not just politicians, industry experts and academics – they were people who had experienced first-hand some of the most devastating and challenging issues facing our society. It made me think – why is it that in the debates around homelessness, poverty, mental health, or any other challenge our generation faces, I’ve never heard the voice of someone who has lived through the reality? We need to remember that behind every dire statistic in the news headlines, every fierce debate between those of different political ideals as to how exactly we measure the issue, our people, our next generation are suffering. One child growing up in poverty is one too many. It is so important to amplify these voices – you can turn your head from a statistic but it is much harder to look away from another human being. Participants at an event entitled “Youth Building Peace”, commemorating International Youth Day (12 August). Never let anyone tell you that your age prevents you from being the change you want to see in the world. At the Festival, influential young people from across the country came together to share how they have lobbied, advocated, invested, studied and served their communities in order to affect change. They have started businesses, changed laws and policies, given a voice to those who are unable to express themselves, and achieved their goals. They are influential teenagers, twenty-somethings, and thirty-somethings who have already made our world a better place. August 12th is International Youth Day, an excellent chance to celebrate your individual achievements, the amazing accomplishments of your friends and peers, and to appreciate that anyone, no matter how old, can be a voice for change. US Withdrawal from UN Human Rights Council – Do the Rights of Palestinians Matter Less? U.S. Secretary of State Mike Pompeo and U.S. Permanent Representative to the United Nations Nikki Haley deliver remarks to the press on the UN Human Rights Council. Photo by the U.S. Department of State. The US rationale for leaving the Council centres on one topic – the Israel/Palestine conflict. The US ambassador to the UN, Nikki Haley, firstly accused the Council of a having a “chronic bias” against Israel, and followed up by labelling it a “hypocritical and self-serving organisation that makes a mockery of human rights.” This comes after a vote in May deciding to send war crime investigators to Gaza to investigate violations and abuse of civilian protestors. Since protests began in March of this year, Israel has killed 106 Palestinians, including 15 children. These figures do nothing to sway the American stance – that too much focus is put on Israel by the Human Rights Council. 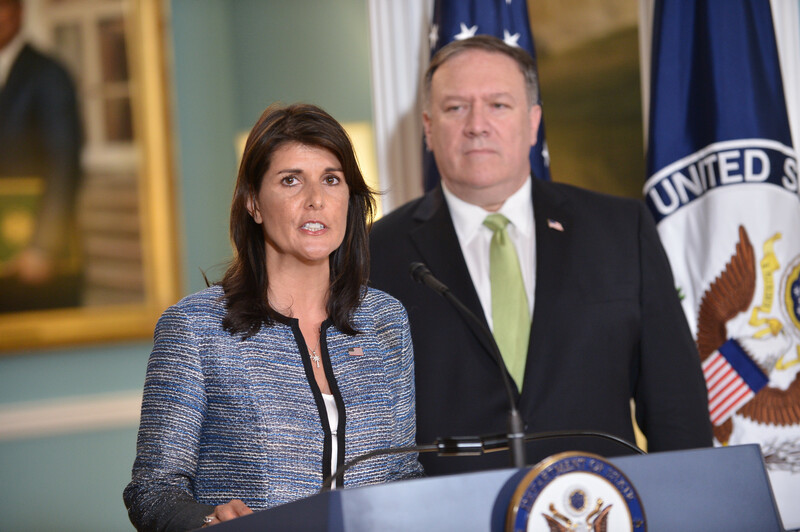 The withdrawal from the Human Rights Council is a consequence of a larger problem, a persisting, one-sided, and frequently inaccurate narrative that runs through American rhetoric. The US government continuously attributes outbreaks of violence to Hamas, the de facto governing body of Palestine widely considered a terrorist group. Following protests and killings in May, spokeswomen for the US State Department claimed any “misery” faced by the people of Gaza was entirely because of Hamas. Yet this ignores two vital elements to the reality of this conflict. Firstly, those killed in protests are generally unarmed civilians – videos from cellphones continuingly affirming this. In addition, there is no acknowledgement of the role that Israel has played in the suffering of Palestinians. The occupation of the Palestinian territories by Israel is the longest in history, dating back to 1967. The Blockade of Gaza Strip has carried on since 2007, banning both necessities, such as blankets or shoes, and seemingly harmless goods, including crayons, chocolate, and shampoo. Israel has been an active participate in the suffering of Palestinians, regardless of what crimes have been committed by Hamas. Posted in UN NewsTagged diplomacy, Equality, global, government, human rights, international relations, peaceLeave a Comment on US Withdrawal from UN Human Rights Council – Do the Rights of Palestinians Matter Less? Aotearoa Youth Declaration is an annual conference for High School Students which connects young people with government policy. Participants work in Focus Groups to develop policy statements that represent their views and priorities on a range of subjects. The statements below were drafted by the participants of the Governance Focus Group, and approved by the participants at the Conference. 1. We recognise that the current voting age is at 18 years old. However, we strongly encourage that civics education should be actively endorsed within schools, after which lowering the voting age to 16 should be explored. 2. We recommend retaining the current system of Māori electoral seats while investigating more effective and democratic methods of ensuring Māori representation. Recognition of Māori rangatiratanga over Māori land and culture. 5. We recommend lowering the MMP voting threshold to 3.4% (4 seats), to gain wider representation of minority opinions. We think the purpose of democracy is to uphold minority viewpoints as much as to allow the rule of the majority. 6. Participants were divided on whether New Zealand should adopt a codified constitution. Some participants opposed a written constitution as they thought it would prevent future evolution of New Zealand’s governing arrangements, particularly the role of the Treaty, while others were for it as they believed a written constitution could provide greater accountability on decision-makers. An enormous thanks to the Focus Group participants, the Facilitators – Julia and Julia, the Conference Organising Committee, and the Event Sponsors. I was privileged to sit down with Mark Mitchell, the National MP for Rodney and discuss civics engagement and ask some burning questions I had in regards to youth engagement. I firstly asked why he thought that a large proportion of high-schoolers deem politics to be boring or unimportant. Mark’s perspective was that youth don’t see politics as relevant to their lives and that at this age they are busy with other factors of their lives, it is thus not at the forefront of their minds. Mark talked however about Rodney’s youth and said that comparatively in his area he has come across very politically engaged youth including those in his youth policy group; so he has hope for the future! Following on from this idea of politics being unimportant or boring I focussed on what ways the political landscape could be altered to be less inhospitable to those that wanted to be engaged. I found it interesting that he found social media to be an important tool in changing this paradigm which I agree with as I think that as we move to a modern era where the media is increasingly important, we need to recognise and utilise it to our full advantage. The growth of youth wings he thought was also beneficial as they provide youth with the chance to hold discussions with others, which often makes it easier when debating politics. He further spoke highly of the electoral commission’s work of placing voting booths at common places such as supermarkets in order to not only make it more accessible but to make it more “normal”. 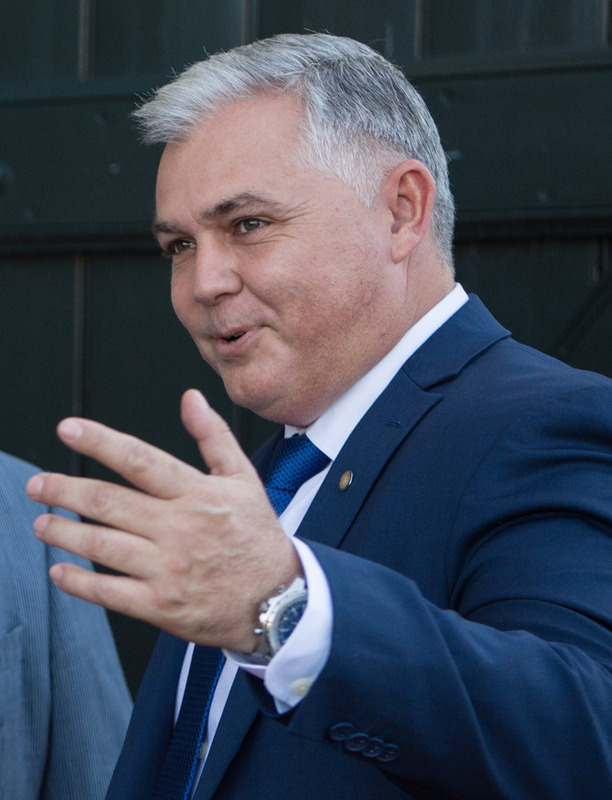 In the last election, it was apparent that the age group with the lowest voter turnout was youth and I questioned Mark on if he thought it was the role of an MP to encourage youth to vote. His response; “Yes, absolutely”. Myself and Mark further to this had a conversation on the level of access to MP’s that we have in New Zealand and we both agreed that we are extremely lucky to have the level of openness and accessibility we do. However, youth need to utilise that more than they currently do. In regards to countering this low youth voter turnout, it was Mark’s suggestion that the best ways to get involved were by joining a young political party but that engagement doesn’t just have to be on a national level it can be on a local level too with engagement with local boards and decisions made at that level. 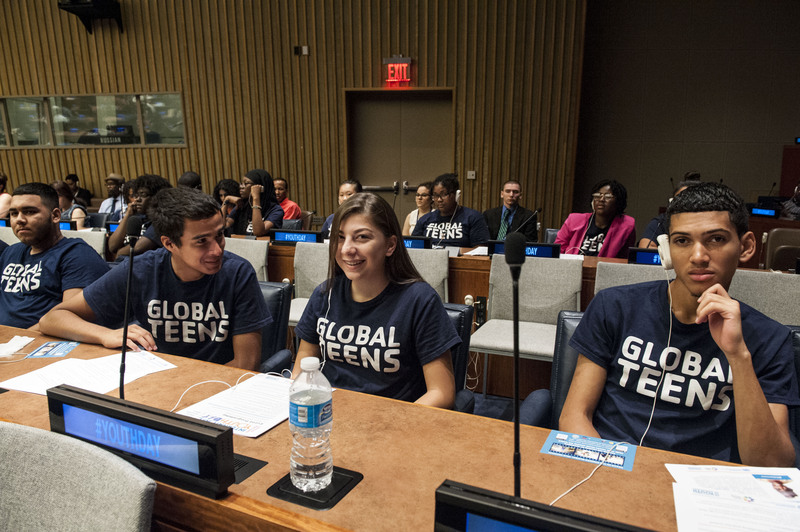 “ Organisations such as UN Youth are great for that sort of thing”. We discussed topical issues such as the lowering of the voting age and civics education in schools and it was very interesting to hear his opinions on both. Mark was for the idea of civics education but recognised the strain it would place on our curriculum as it is currently full and there are always things that need to be included so it’s not as easy as we may think to introduce it.” But this is why organisations such as UN Youth are so useful and informative in providing youth with a civics education”. As previously said the level of openness and accessibility is unbelievable in New Zealand and Mark really wanted to show that he is contactable on any medium; Facebook, Twitter, Email, Texting, and by visiting him in his electorate office. The onus is now on you to make the first step and contact your local MP and connect, tell them what you think needs to be improved or what you want to see because that is how change happens. At this very minute, a dire economic crisis is in full force in Venezuela, a South American country which many New Zealanders would find difficult to place on a map. Basic food and medical supplies have become scarce commodities, the currency has devalued to the point of worthlessness and the government is on the verge of collapse. But how did this happen in one of the world’s most resource-rich countries? It seems almost implausible that, in a world where the price of oil increases as finite supplies are depleted, that the country with the largest oil reserves would be suffering from such a crippling economic situation. Basic necessities, from rice to toilet paper to paracetamol, are scarce resources in Venezuela. People queue for hours for small quantities of food, access to which may be manipulated by corruption or theft. Soldiers guard supermarkets to prevent rots. Government inaction has been blamed for deaths due to malnutrition or easily treatable illnesses. In fact, there are reports that conditions in Venezuela are akin to those in refugee camps, not a developed country. 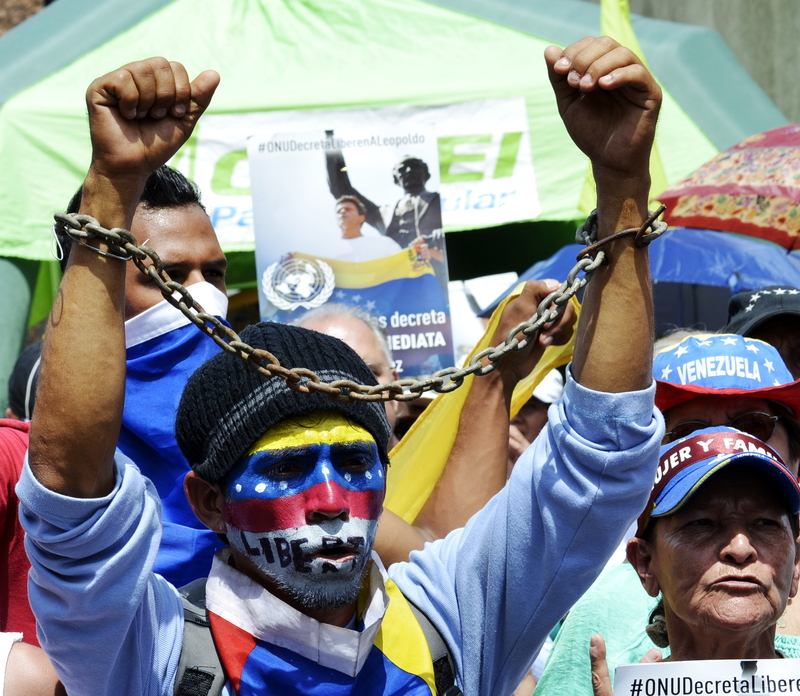 However, despite reports of that a humanitarian crisis is occurring, the Venezuelan government has declined international aid, blaming globalization and the 2014 fall in the price of oil, and rejecting any international interference. An individual demonstrating, symbolically wearing chains. Photo by Carlos Díaz. Venezuela’s difficult political history is often difficult to extricate from the complex economic issues the country faces. However, many trace the route of the crisis to 2014, when high oil prices dropped, drastically reducing the value of Venezuela’s most important export, oil, and causing a recession. Burdened with historical debt with decreasing resources to pay it, the government limited imports to save costs. Due to a reliance on imports during more prosperous times, Venezuela has little domestic food production resources and thus shortages began. Venezuela challenges our traditional perception of what a country in crisis looks like. Humanitarian disasters happen in developing states which lack infrastructure and resources, not one of a continent’s most resource-rich countries. Perhaps the most important idea which can be taken from it is that globalization and high levels of overseas imports may not always bring prosperity. As interdependence increases, so too does the risk to smaller countries, to countries who borrow heavily and to countries who turn away from traditional methods of domestic production to more lucrative developments. I didn’t even know World Freedom of Press Day was a thing. Maybe that’s just me. Maybe everyone else knew it about it. Either way, now that I do know about it, here’s why it’s important. In other words, today is a day in which we remember how valuable it is to have a press that is free from outside intervention and are capable of reporting on the stories that matter to New Zealanders. As a working journalist, albeit one that is often found writing about cats up trees or reporting on something a Kardashian said, I still understand the vital importance of a free press. If a story needs telling – even if it damages those in positions of power – I can tell it. 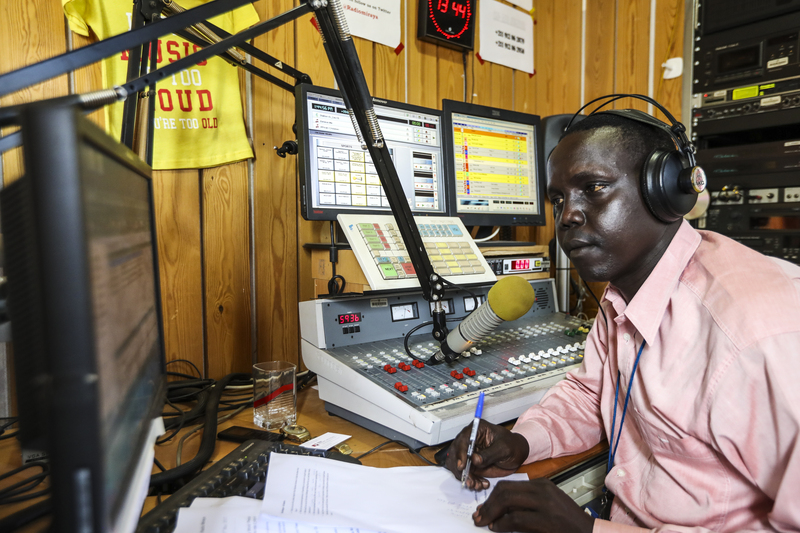 In some countries around the world, journalists aren’t so lucky. According to Reporters Without Borders, an international non-profit organisation dedicated to freedom of information and of the press, more than a third of the world’s people live in countries where there is no press freedom. Unsurprisingly, a number of the countries at the bottom of the press freedom scale are those with the most repressive, dictatorial governments – North Korea and Turkmenistan, for example. Conversely, and thankfully, New Zealand was ranked in the top 5 in 2016, alongside Finland, the Netherlands, Norway and Denmark. What this means is that in countries without a free press, citizens are shut out from the conversations that really matter. In my opinion, while much of the media serves to entertain or to inform, the real importance of journalism is holding power to account. Genuine political discourse is important to allow people to make informed decisions and understand their place in society. So, sure, I didn’t know that May 3rd was World Freedom of Press Day before sitting down to write this piece. But now I do – and I know that it’s something that deserves acknowledgement. Because in New Zealand, we’re fortunate enough to have a free and functioning press– but so many millions of people aren’t. Millions of people are left without a voice and the chance for abuses of power to be checked and corrected. Without a free press, what hope do we have for fair governance and a working democracy?